A Thought Shared ....: A message to the Rest of the World.. The English and French fought for centuries. It was a point of pride with both nations, bold French Knights pitted against scruffy yet highly effective English (Welsh) archers. Where the French went, the English were sure to follow, if only to upstage the French, proving that they were more ruthless. Then one day they sat down together and produced this. It all seemed so heady in the concept and early design stages. Sometimes, the TV news would show huge pieces of airplane being carted around the English and French countryside. All of the parts arrived in Britain for assembly at Filton. We watched Brian Trubshaw, BAC test pilot extraordinaire take her up for the first flight. Absolutely magnificent. For 30 years, aviation enthusiasts were enthralled by this white supersonic arrow. It left the most distinctive vapor trail of any passenger airliner, and you knew it was Concorde because no other passenger jet ever crossed the sky so fast. 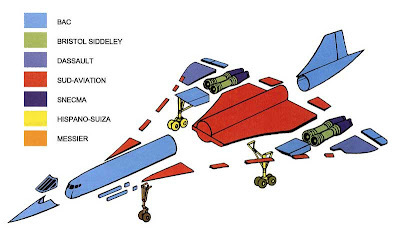 Of course the noise of its four Bristol Siddeley Olympus jet engines were not so welcome, especially if you lived under the flight path near any of the airports that it graced, but you can't take away the achievement. 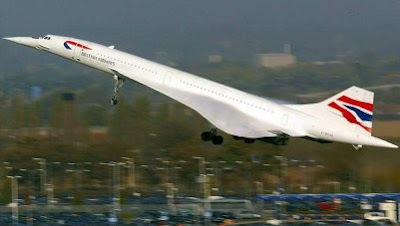 Regardless of what follows Concorde in the future, this bird will always have been the very first. This diagram shows the breakdown of who made what. A tribute indeed to two nations that had the longest tradition of war against each other. It is amazing what can be done when people and nations choose collaboration over killing.